Background: The EGFR/Akt/NF-κB signalling pathway is frequently deregulated in pancreatic cancer and contributes to cell growth, metastasis and chemoresistance. 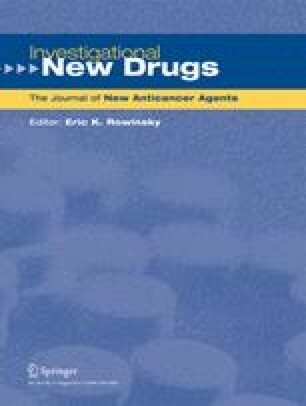 An isoflavone, genistein, inactivates Akt and NF-κB and enhances the anti-tumor activity of erlotinib and gemcitabine in experimental systems of pancreas cancer. This phase II study was undertaken to determine the effects of adding isoflavone to a regimen of gemcitabine and erlotinib on survival in patients with advanced pancreatic cancer. Methods: Eligibility included previously untreated patients with advanced pancreatic adenocarcinoma. Patients received gemcitabine 1,000 mg/m2 on days 1, 8, and 15, and erlotinib 150 mg once daily P.O. on day 1 to day 28. Soy isoflavones (Novasoy®) were administered at a dose of 531 mg twice daily P.O. starting day -7 until the end of study participation. Results: Twenty patients with advanced pancreas cancer were enrolled (median age 57.9 years). Sixteen patients had stage IV disease. The median number of cycles was 2 per patient. The median survival time was 5.2 months (95% CI, 4.6—N/A months). The probability of survival at 6 months was 50% (95% CI, 32–78%). Conclusions: The addition of soy isoflavones to gemcitabine and erlotinib did not appear to increase the survival of patients with advanced pancreatic cancer. This study was supported in part by Cancer Center Support Grant CA-22453 and Pancreas SPORE P20 CA101936 from the National Cancer Institute, Archer Daniel Midland Company and by OSI Pharmaceuticals.